Students in the service learning group A Million Knots turned the athletic center into a catwalk Friday night, all for a good cause. Nearly 300 people attended Rajasthan Rising on March 3 to help raise funds for girls' education in India. After a delicious dinner prepared by Bombay Coast, attendees heard from speakers representing Project Concern International, WomanCare Global and the service learning group Liberty in North Korea. The show was powered by service learning group Alternative Energy Sources and other service groups were on-hand to spread awareness of different causes. 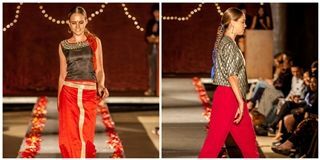 Notes of Hope and On Pointe entertained audiences and then a dozen Pacific Ridge students modeled student-designed outfits inspired by Indian culture. Funds will continue to support the A Million Knots School in Rajasthan and a vocational school in New Delhi.